At Gheling(3,570m), despite the cold high wind, my three companions decided to take a stroll around the village, still close to an hour left before dark fell. With a mild headache and fever-like chills, I chose instead to rest, huddled before the iron stove in the dining room of the lodge. Sonam, the hostess, and Chhiring, her two-years-old son, who reminded me of my grandson, kept me company. The lovely boy, eventually, won the heart of rest of my companions, too. Typical of all dining rooms of the inns and lodges we stayed on the way, the room that doubled as kitchen and dining appeared bare save for colourfully painted wooden tables and benches with rectangular woollen rugs spread over the top. One of the walls proudly displayed the framed photograph of His Holiness, the 14th Dalai Lama. The boys appeared in about an hour when I’d sampled a glass of the heated local ‘Uwa’ liquor and went for the refill. The heat from the yak dung-fired stove and the drink really seemed to take the chill off. I listened excitedly to the sensational story they recounted to me. 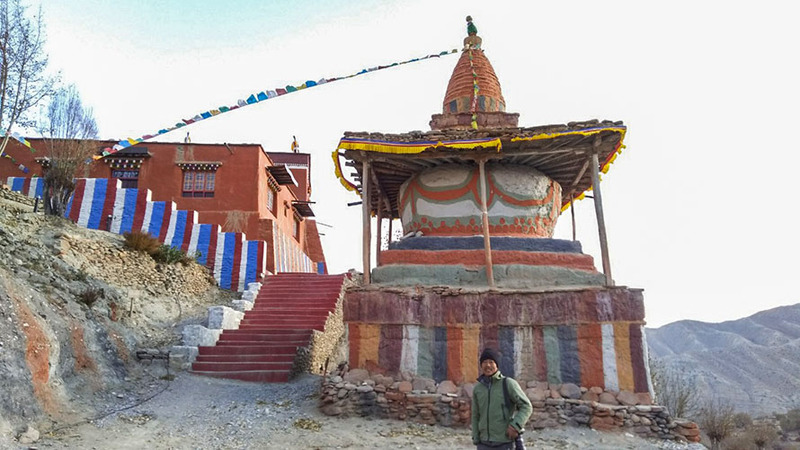 At the red-painted Gheling Pal-Sa-Ngor-Tashi Choeling gompa (monastery), Kunga, the teen-aged postulant seeking initiation into Lamahood (monkhood), led my friends around. Apart from his passion to become a lama, his interests included painting and showed some of his works. At length, he produced a small bundle swathed in red cloth and unwrapped it. What my friends witnessed then caught them completely off guard. The young monk held in his hand the mummified severed right hand, which he claimed dated back 500 years. The guys stared at it, which still held a gold ring in the ring finger. “The hand belonged to the thief who entered the gompa and tried to purloin one of the many valuable statues. 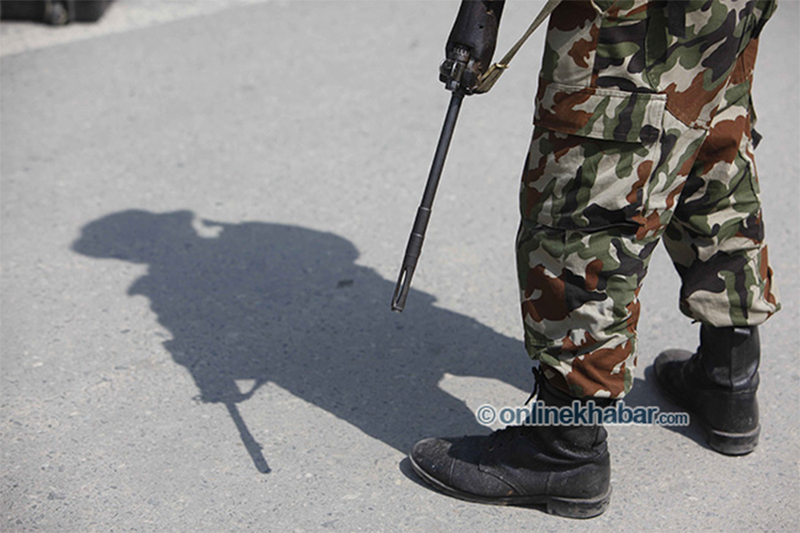 The custodian at the gompa foiled his effort, chopped off his right hand and handed him over to the authorities. There is one at the Tsarang gompa, too, ” informed Kunga. Upon Kunga’s assent, my friends, still in disbelief, gingerly touched the preserved hand, but when they tried to take a picture, the young monk forbade them. “The touch felt real, nothing even distantly close to rubber or plastic, “said Shayeet and the rest stood firmly by him. Back at the lodge, Sonam confirmed the veracity of the story, already the local lore. As they exited the monastery, an uneven pile of stone slabs with a sheep’s horn nearby caught their attention. As they examined closely, the heap turned out as inscribed mani stones; the horn too bore devotional Tibetan letters chiseled at the base. Windless and sunny, the morning proved beautiful the next day when we left Gheling and set out for Tasarang, 18km away. As the two red-painted gompas, my friends visited the other day, looked conspicuous high on the hillock, horses grazed at the foothill on a patch of grass. To our great surprise, the road appeared wide and very smooth, as if, just compacted. It, however, again turned rugged and gravelly after we hardly covered two kilometres. At first, the rocky road climbed gently from the valley across dun-coloured dunes filling the bare landscape but gradually turned steep. We rode along the isolated, rugged, treeless, and parched country listening to the wind and our own heartbeat. As we stopped at Jhaite( 3,820), a small hamlet for a short break for tea and refreshment, the wind seemed to wake from its sleep. I became a shade apprehensive when Khasing informed us that we would soon climb the 4,020m high, Nyi La pass (4,020m), the highest on the road to Lo Manthang. I made it to the crest little after my friends, gasping for air but nothing made me happier to know that I prevailed over the highest among all the passes. Even the howling cold wind biting at my face sounded like the orchestra to my ears. Moments later, a group of motor-bikers tore up the road and stopped at the pass kicking up clouds of dust. Australians, back from Lo Manthang! We spent some time at the wind-torn pass to rest and exchange excited colloquy with them. The wind seemed to rip the colourful prayer flags and khadas off the pole held by a mound of stones and rocks–the sharp whipping sound clearly audible over the awful din of the gale. And the skyline in the distance, from the east to the south, proudly rolled out the whole shebang of snow-clad peaks: the Thorung Peak, Kangsar Kang, Khatung Kang, Annapurna I, Tilicho peaks and the Nilgiri Peaks, the last two curiously always watching us from behind like ghosts as we spun along the long road to Lo Manthang. 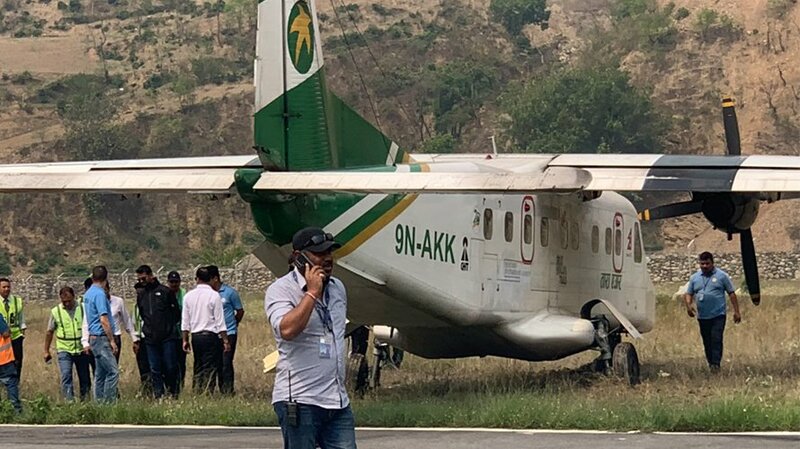 “Dai, one of your friends has fallen off the bike,” called one of the Nepali bikers with the group. We rushed to the edge to see Diwas lying way down on the steep slope. Fearing the worst, we rushed down to him on the treacherous scree-laden track. Luckily for him, he received minor cuts and bruises needing only first aid. We did our best to patch him up but could do nothing about his busted right brake. Miraculously, he got back on his feet after a short rest, ready to hit the trail. Our progress slowed down following Diwas’s injury and as he’d only the front brake to work on. Soon, another pass, the Ghami La (3,765m), loomed ahead. The pass proved deceptively easy, though. We peered over the ridge and sighted the sprawling settlement of Ghami, (3,510), the third largest after Lo Manthang and Tsarang. The valley surrounded by groves of the native deciduous tree, the pencil poplars, the willows, and the scattered clusters of apple and apricot orchards gave the town a prosperous look. Perched on an overhanging embankment, the large settlement of Ghami commanded in the southeast, a view of curiously shaped fluted sand-stone cliffs redolent of huge pipe organs adorning the ancient churches of Europe. As we entered the town, extensive fields with the harvest-ready golden barley swayed in the wind and sun-drenched landscape. We stopped by a hotel called Lo-Ghami for lunch. A pleasant surprise awaited us at the forecourt of the hotel. 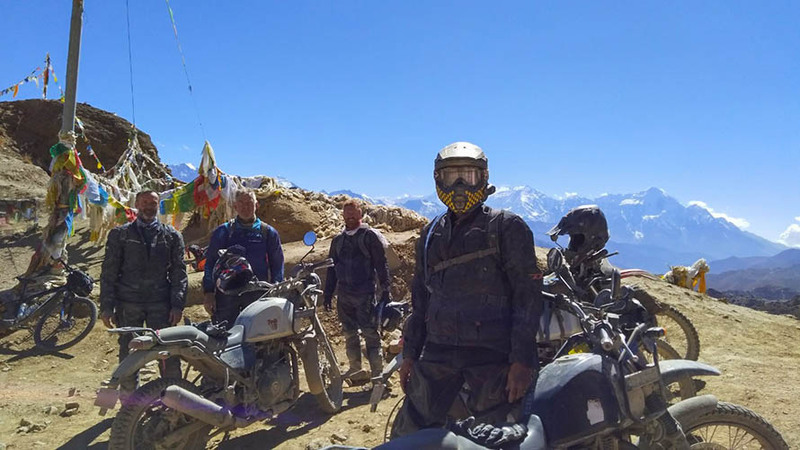 The place crawled with trekkers going to or back from Lo Manthang–a mixed bag with Germans, French, Australians, British, and some Nepalese (mostly motor-bikers). The biggest surprise included the Canadian ladies, the quartet we met at Samar. Equally surprised, they waved like mad at us. Famished, we hastened to place an order for our routine dal-bhat. Good heavens! The owner told us that they had completely run out of food and seemed reluctant to cook at that hour. We bid a hasty goodbye to the ladies telling them we would catch up with them in Lo Manthang, and left. Luckily, the lady at the home-stay just down the road agreed to prepare food for us. Ding-Dong, time for dal-bhat, and a much-deserved rest! Whoa! You should have watched Shayeet at the dining table. He ate like a pig (no pun intended buddy)! We left Ghami around two in the afternoon. We rode past some crumbling chortens on a slight incline and dropped to a small stream with hardly a trickle. After a couple of kilometres, as we cleared on to flatter land, what we saw made us stop and literally gawk at it. What at first looked simply like a stone wall, turned out an impressive mani prayer wall (305 meters long), said to be the longest in Mustang, if not Nepal. 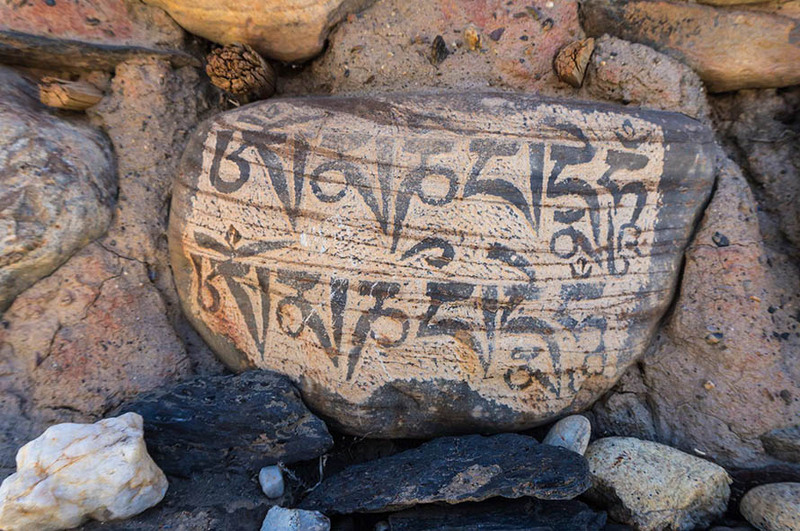 What amazed us most at a closer look was to find nearly every stone inscribed on its face with the six-syllable Avalokitesvara mantra: om ma ni pad me hum. Funny as it may sound, I started mumbling the mantra to myself; my subconscious seemed to prompt me. And as dignified as they looked, towering wind-sculpted bizarre-shaped hills stood ahead in the east in the deepest hue of red with the sides in shades of grey, light blue and brown against the blue sky. My imagination ran riot. It looked as if an entire army of men took up the Herculean task of hurling tons after tons off red, grey, blue and then brown paint over those craggy cliff faces. The time seemed to stop. And the atmosphere in that intriguing wilderness seemed to exude an uncanny sense of energy and powerful vibrations. Little wonder, those hills and the long mani wall seemed steeped in mystery and legend. Going by the local myth, the story goes back to the 8thcentury when the emperor of ancient Tibet, Trisong Detsen, sought help from Padmasambhava also widely known as the Vajra Guru Rinpoche, to deal with the demon who wrought havoc on the construction of a gompa at a village called Samye in Tibet. The demon frustrated every effort made by the monks to build the monastery and the work came to a standstill. Pursued by the Guru Rinpoche, the demon fled deep into Mustang, Nepal. He, however, cornered the demon at Lo Ghekar and slew him there, the gushing blood spilling over the cliffs at Ghami and the intestines becoming the foundation for the mani-wall. Guru Rinpoche then went onto build a monastery at Lo Ghekar. 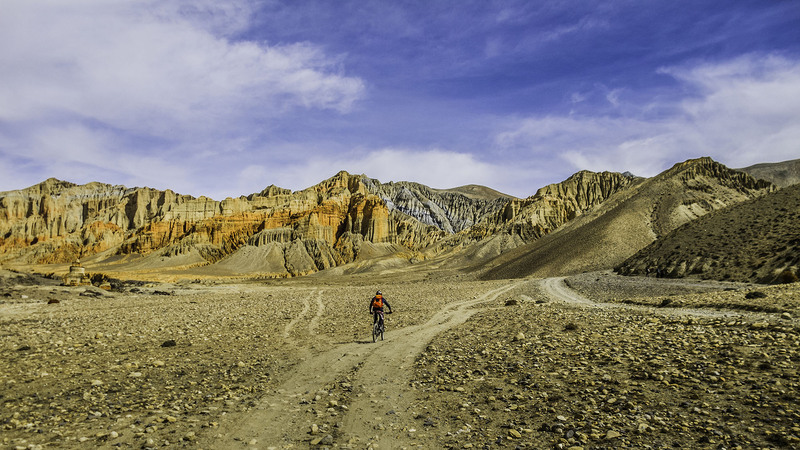 That 8th-century monastery is known today as Ghar Gompa, considered the oldest in Mustang. The Samye Gompa was successfully built in Tibet immediately following that landmark event. We could not visit the monastery as it did not lie on our way. As we followed the road north, we noticed in the far corner another famous chorten called Khorok Chorten in a curious minaret shape. As the jeep track wound up gradually, the strong wind, the clear sky, the warm sun, and the bare hills kept us company. Soon the climb began, and we braced ourselves up for the Tsarang la pass (also called Chinngel la, choya la) at 3,870 meters. 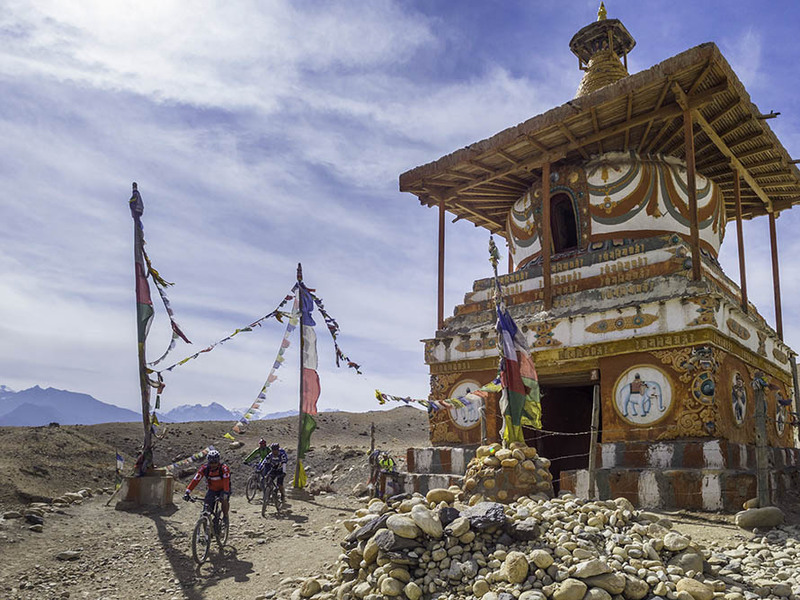 At the top, we were greeted by the telltale flagpole held by a mound of rocks and stones (apparently a cairn) and draped with khadas and colorful prayer flags with prayer mantras printed on them. The holy text on those flags stands for peace, compassion, strength, goodwill, and wisdom, as they. The wind is said to act as the courier to spread those values far and wide. As we sipped water and breathed hard to fill our oxygen-starved lungs, I saw something overhead. I squinted in an attempt to see more clearly against the bright sun. And there they were, the Himalayan Griffons! Native to Mustang, these highland vultures (Gyps himalayensis) are pretty large birds and weigh from eight to as much as 12kg with a wingspan of 2.5m to 3m. I watched in awe at those magnificent birds circling around soaring effortlessly on the thermals on their wide outstretched wings. The Himalayan griffons live solely on carcasses and carrion. 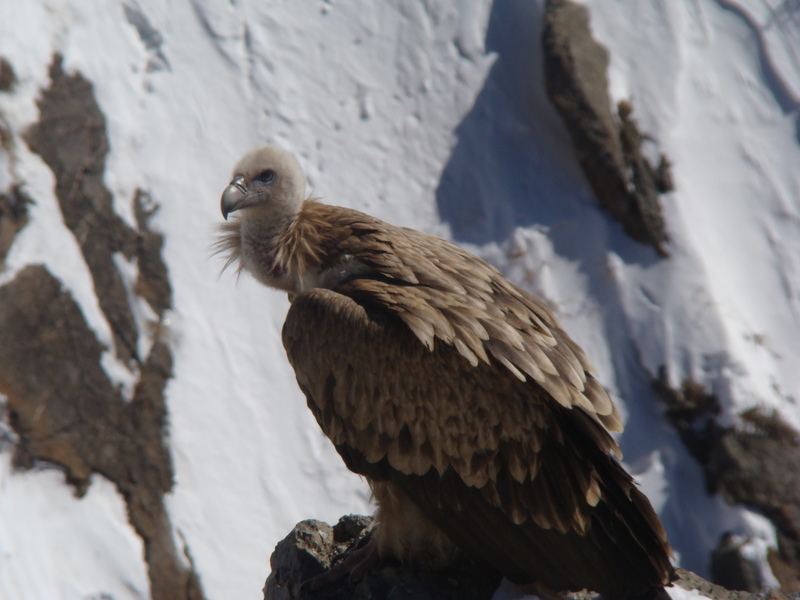 They nest in high cliff edges and even abandoned sky caves in Mustang and are often sighted at Chhuksang, Yara, Ghemi and other areas. I tried hard to pick out from the group the Himalayan Lammergeiers (Gyapaetus barbatus), or the bearded vultures, a close cousin to griffons also found in Upper Mustang but I could see none at that distance. 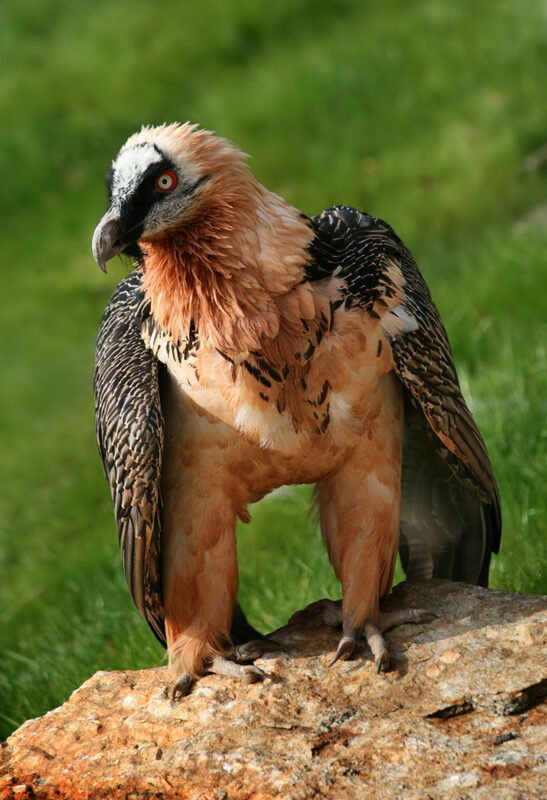 As birds of prey, the lammergeyers scavenge like the griffons and live on high crags but surprisingly their diet consists of 90 per cent bones (the marrow being their favourite). 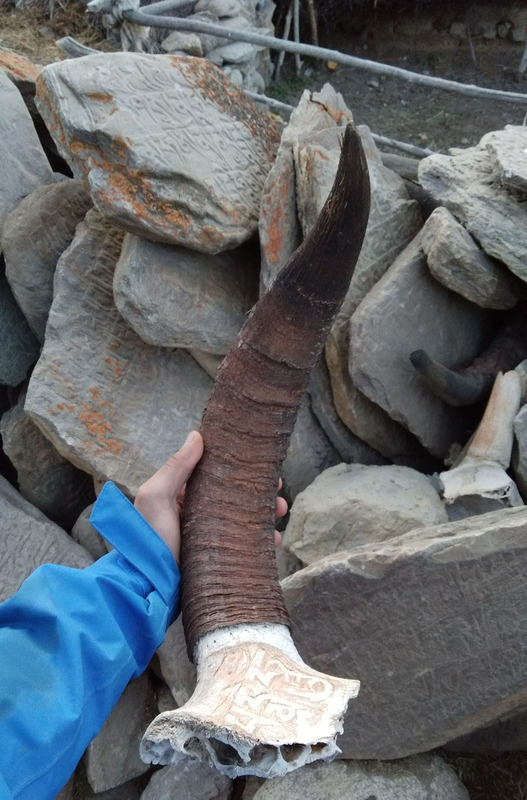 Almost as large as the griffons, if not bigger, they are said to gobble up the bones after they are picked clean by the griffons. 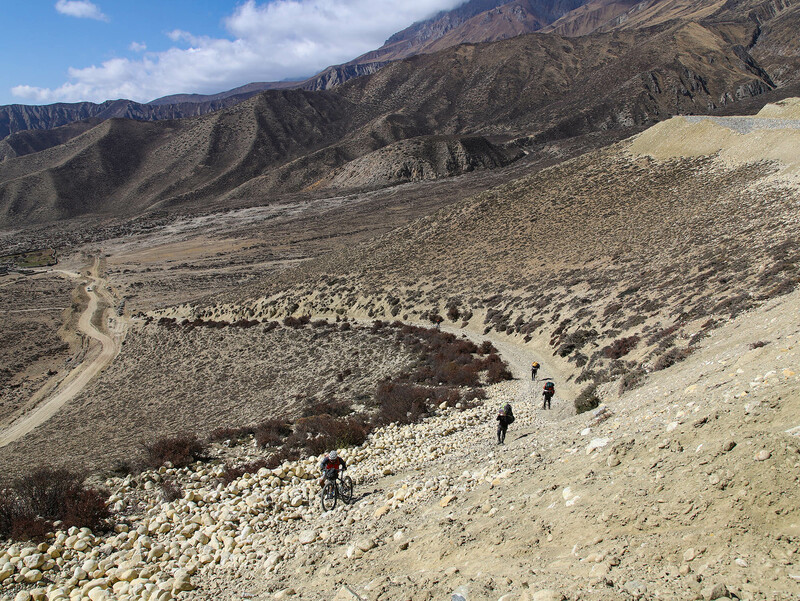 The number of both the griffons and lammergeyers in the Upper Mustang region are on a rapid decline by almost 75 per cent. Despite the decline, both species are considered only near threatened on the IUCN Red List. 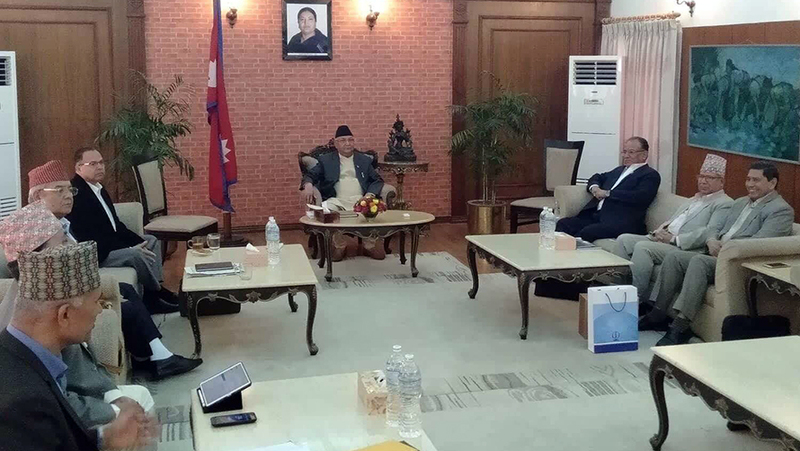 “Perhaps, it’s time the authorities looked into it and reassessed their status,” argued Wangchhen Lowa, or Ram Gurung as he is mostly known. A resident of Lo Manthang, he works at the ACAP office and has been with them for the last 20 years. 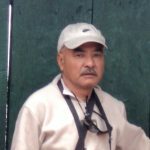 I met him during my stay in Lo Manthang. His wife, a charming lady, runs a prominent hotel called the Mystique Hotel in Lo Manthang. 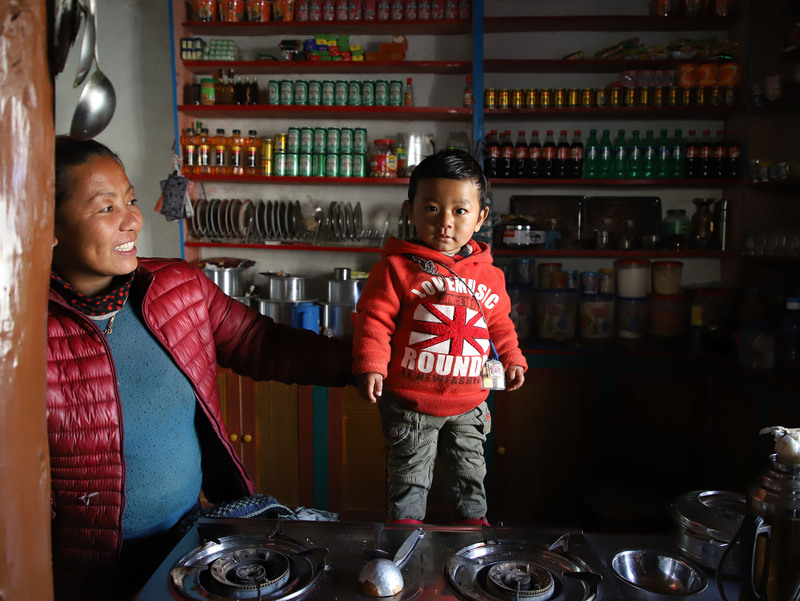 “Lo in Tibetan dialect translates to ‘South’ and Wa stands for an ‘inhabitant.’ Sherpa, on the other hand, signifies ‘Sher’ as ‘East’ and ‘Wa’ an ‘inhabitant.’ ‘Sherwa’ is said to have degenerated later to Sherpa,” said Wangchhen Lowa as we chatted over a cup of tea at the hotel. When writing about those vultures, I think a mention of “sky burial” commonly practised to this day in Tibet, Mongolia, and Bhutan would be relevant. My jaws dropped when Wanchhen informed me that the same is still practised in Upper Mustang among the ethnic minorities called the Lowas. I listened in awe as Wanchhen, a Lowa by birth, filled me in with the details. 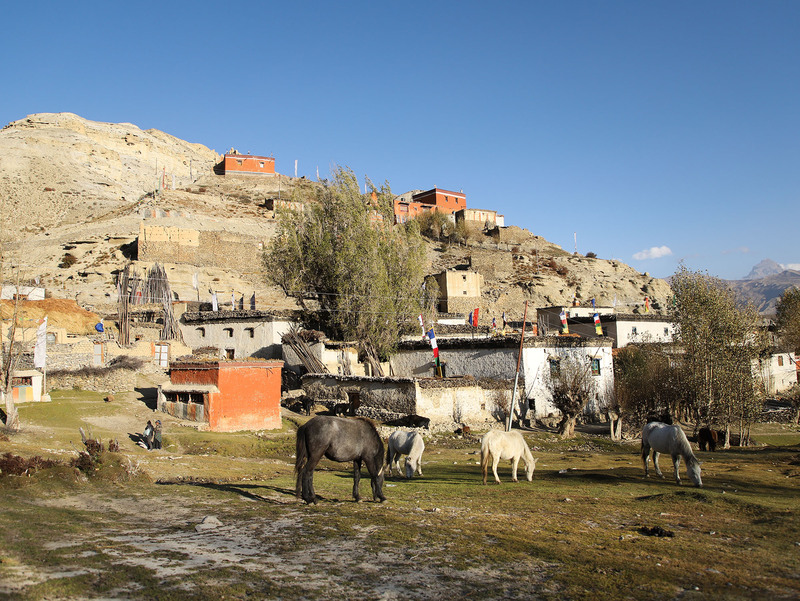 Sky burial as a traditional funeral rite has been retained from time immemorial in Mustang especially among the Lowas. When someone from the community dies, a high lama following religious funeral rites proceeds on to dismember the dead body into pieces and then offers them to the waiting vultures. Curiously, the vultures congregate at the site, when the holy lamas carry out the funeral ceremony accompanied by the beat of drums and playing of the long pipe instrument. It is believed that by performing this rite the vultures transport the soul of the deceased to heaven. If a sinner, the vultures do not appear to feed on the dead body parts. Gruesome, but a stark reality founded on Tibetan spiritual values. After a brief respite, we left the pass, free-wheeling down the windy gravel-ridden road. As we took a bend in the hills, we spotted way down the sprawling large settlement of Tasarang. 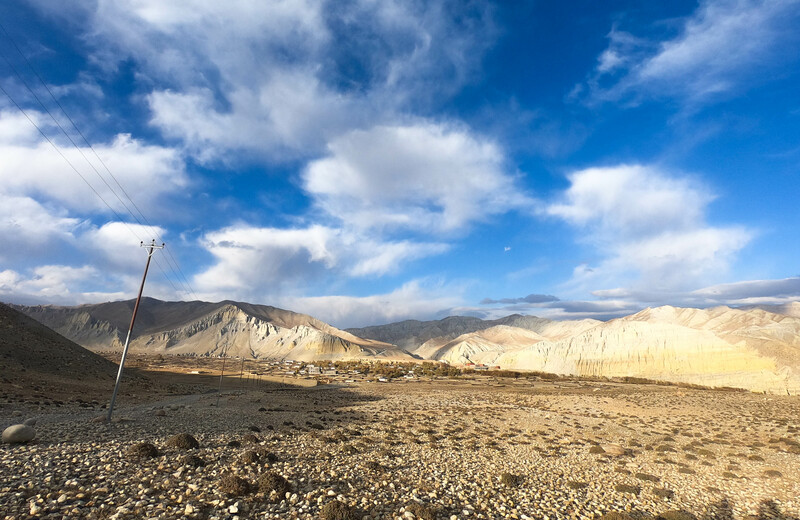 Set amid lush greenery and extensive fields of golden barley, a stark contrast to the surrounding bare, sandy and grey desert-like terrain, the second largest town after Lo Manthang, looked pretty imposing. 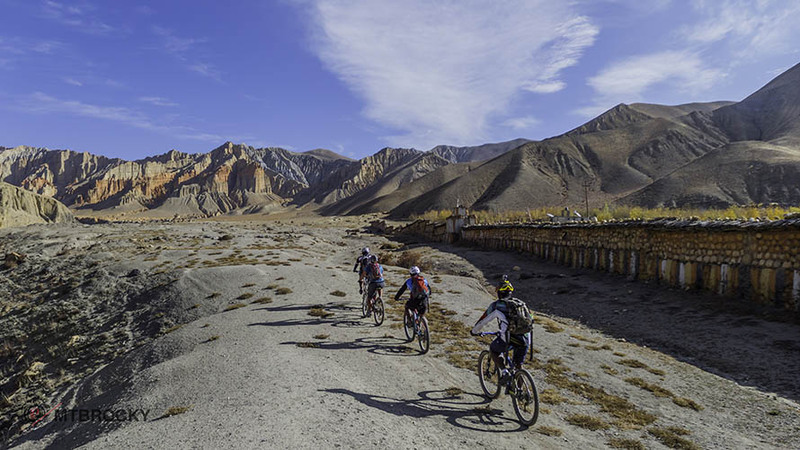 In about half an hour, we were riding past a large chorten with a walk-through built under its roof. Colourfully painted, the roofed chorten walls carried meticulously engraved figures of elephants, some kind of a winged god, a peacock and others. As we rode through the town, we sighted two large buildings, one red and the other white standing conspicuously in the distance. 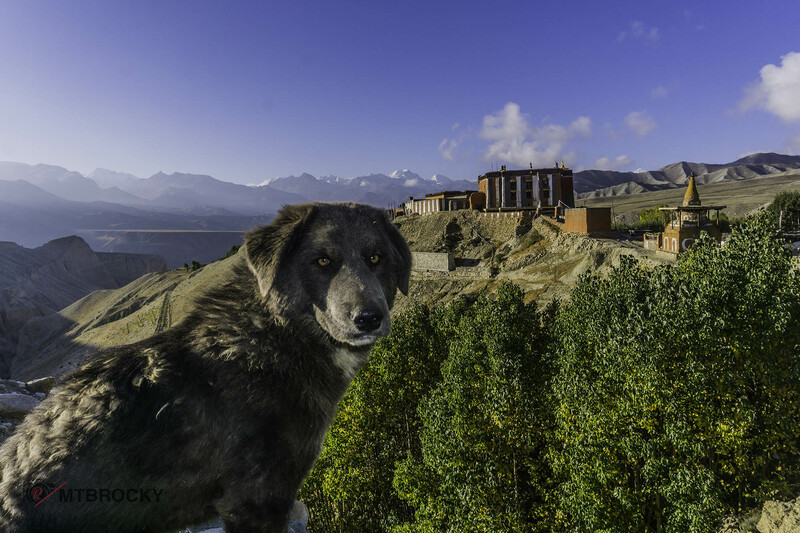 As we got closer, we spotted a huge dog (presumably a Tibetan mastiff, do-khyi in Tibetan), sitting by the roadside close to the red building, which we learned later was the Tsarang Choedhe Shedrup Dhargyeling monastery. As we stopped to look at the building, the vicious-looking dog eyed us suspiciously but stayed rooted in its place and just watched us. A little later as we rode past the white Dzong(fortress) white building, it looked in an utterly rundown state. That was the Royal Palace of the late King of Mustang, Jigme Palbar Bista. The town path led through a maze of narrow lanes with white plastered houses as we arrived at the Maya’s Inn. The fading light and the orange glow in the west signalled that it was going to be dark soon . . . and time we called it a day. The author deserves appreciation for sharing the other-worldly (literally) experience, matching photographs as well as the human element in the harsh environmental conditions. 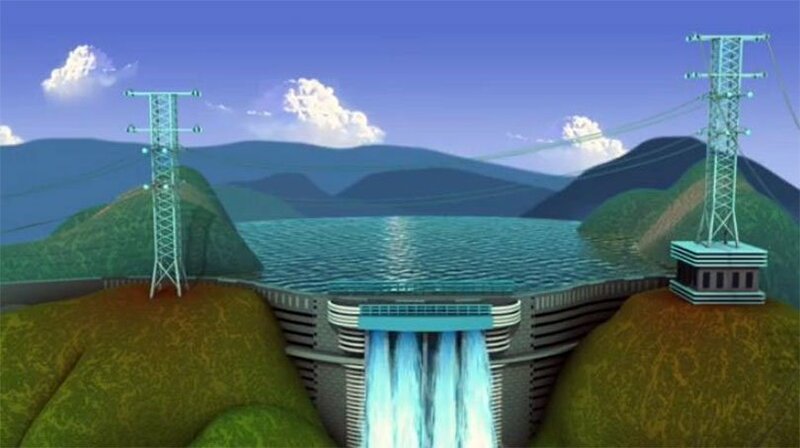 It is more so for people like me who wish to visit such places but fails to do so owing to physical and other reasons. I thoroughly enjoyed the narrative about the trip in the rain shadow area of the country. Ravi sir , you made a such incredible cycle ride up in scerinity, shangri-la and tranquility region of Nepal and an appreciated indeed for your dedication and efforts . We wish to make it one for sure , this would be really an inspiration , so would like to share to all my dear ones . Congratulations once again .BRAVO for being real cycle hero of the nation . Keep it up .